I am here today to spread the gospel of the glue sponge! 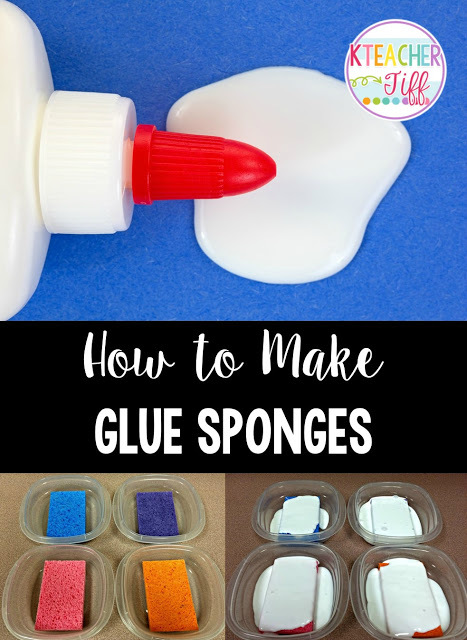 If you haven’t fallen in love with glue sponges yet, then I’m guessing you haven’t tried them! I first learned about glue sponges from Smedley’s Kindergarten Smorgasbord. I thought it was a cool idea, but I also thought, “nah, I’m doing OK.” Glue sticks and bottled glue hadn’t yet become my enemies. Enter interactive notebooks. We started going through about 500 glue sticks a day. 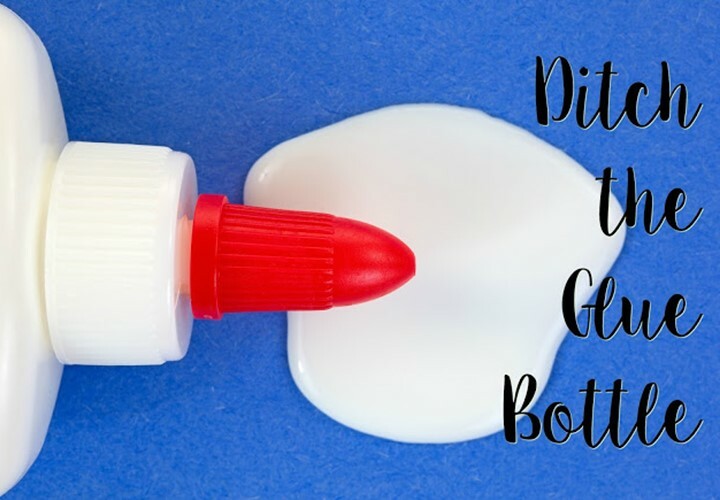 When we tried glue bottles, the phrase “dot, dot, not a lot” was forgotten by just about every student, and they made a huge mess. Glue was now a problem that needed to be beaten. So I made some glue sponges, and I will never go back! 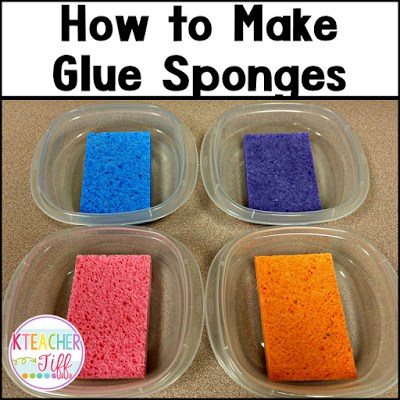 Making glue sponges is super easy. 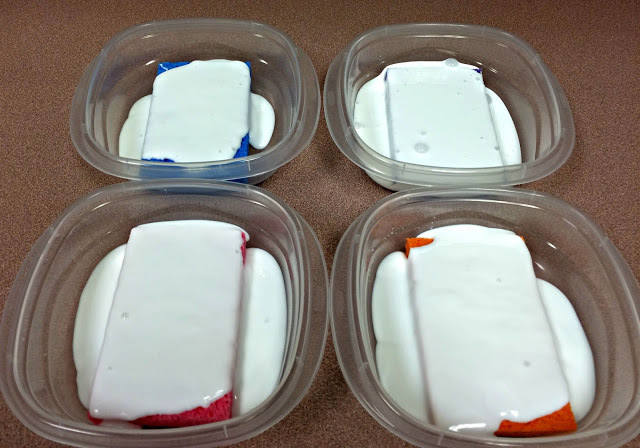 Just gather bottles of white glue, sponges, and plastic containers with lids. I buy these Rubbermaid containers which are cheap but last the whole year. At the end of the year, I just throw away the whole container. Step One: Put sponges in containers. Step 3: Put lids on containers. Allow them to sit overnight. Step 4: Allow your world to be changed. Here is what your glue sponge will look light after a night of soaking. You can see that all of the white goopyness is gone. But there is glue in there! Just have your students dab whatever they are gluing onto the sponge, and will leave behind the PERFECT amount of glue. I am definitely trying this. I teach K-4 and hate glue sticks and bottle glue. I'm forever picking up tops and wiping glue. Thank You! Do you spray before you put the glue on the sponge? They keep an entire school year! You may need to add a little glue here and there depending on how much you use them, but you won't have to replace them all year! Do the sponges stay in the containers, or do they use the sponges to dab on the glue? Like everyone else is asking, how long do they last? The sponges stay in the containers. Your students will just dab the paper onto the sponge and it distributes the perfect amount of glue. 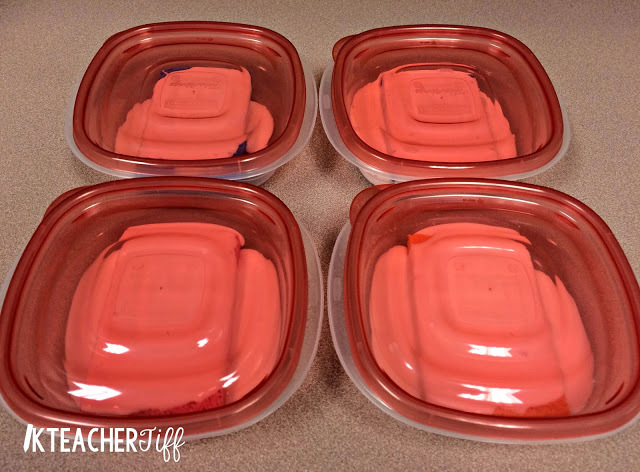 These will last an entire school year, but if you use them a ton and/ or your students don't put the lids on tightly, you might need to add some glue here and there. Every couple of months I check mine and add a squirt of glue for good measure. Also, teach your students to flip over the sponges in the container if the top feels a little dry. – surface area is key. I went with a smaller rectangular container, and in the test run my students had trouble angling their papers in to the sponge. We also found that the edges were drying out faster because there was so much extra air. – on my search for square containers, I found teeny (2"x2")containers at Dollar Tree and decided to give them a try. With some help from my "assistant" (aka: my 6 year old son) we put 1.5 widths of sponge into each container so that we took up most of the air space, and left almost no head room. My high school students say they work GREAT. We have already gone through more than a dozen glue sticks setting up all their interactive notebooks, and we've barely started! These should get more distance. -Damp sponges absorb more glue. (Hello, osmosis.) My package of sponges had gotten dry between experiments, so we used the spray bottle (also picked up at dollar tree) to dampen them enough to flex and cut through easily, and discovered that they also absorbed the glue much more easily! Considering you can dilute school glue by half and still use it in crafts, I think it's safe to use a spritz or two to get it to absorb faster. Haven't experimented with Listerine yet… that will be coming soon. I have the same question about the use. Do the children take the sponge out and dab the back of their paper or do they press the back of their paper onto the sponge in the container? My guess is the latter but I just wanted to know. You are correct! They will just dab their paper onto the sponge. The sponge stays in the container. You will have the perfect amount of glue every time! I loved using these in my 4K classroom. The sponge stays in the container. The kids touch their object to the sponge, then stick it to their project. This idea is so neat! Really! Definitely going to try it. 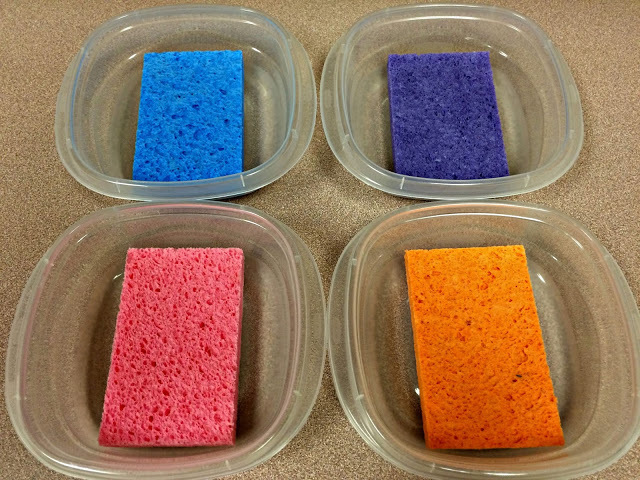 Couldn't tell the size of container or if the whole sponge was used, but am thinking sponges could be cut smaller and use smaller containers. Easier to share if the whole sponge is used, I guess. Question, does mold eventually grow on the sponges? Someone mentioned spraying with Listerine and water to prevent this from happening. Does anyone know? Yes you can definitely cut the sponges to size to fit the containers. Think sandwich sized containers. I have never had an issue with mold or a smell, but I have heard of the listerine trick too! Seriously? They don't dry out, become crusty and need re-done? Somebody answer all these and the above questions PLEEZE! They really do last all year! Depending on how much you use them, I'd add a squirt of glue on top of the sponges every couple of months. That's how often I do but your needs may be more or less. If you make sure the lids are good and tight, you're good to go! I swear they must eat the glue sticks! Just plane old Elmer's white school glue! I make new ones every year. you can wash out the same containers…you could probably use hot water and clean your sponges too, but by the end of the year they will be starting to get crusty and sticky and it's easier to just toss them! 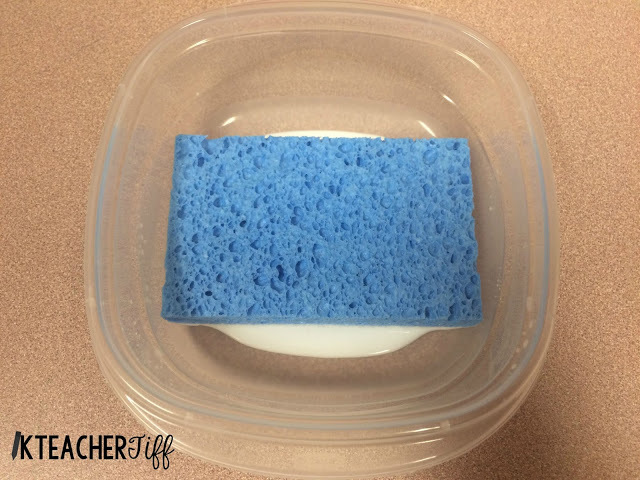 Love this idea, but to stay on the 'green side' of things, have students wash the sponges and containers at the end of the year in order to teach them a lesson in conservation of supplies, preparation for the next group of kids, and respect for the environment. How much glue do you actually put on the sponge. The entire bottle??? U pour straight glue? U don't mix water? Retired teacher! If only I'd known ! Never mind, art group loved this for collage work ! You're never too old ! I am going to have to try this. Even my 6th graders make huge messes with the glue! Thanks for the pictures. 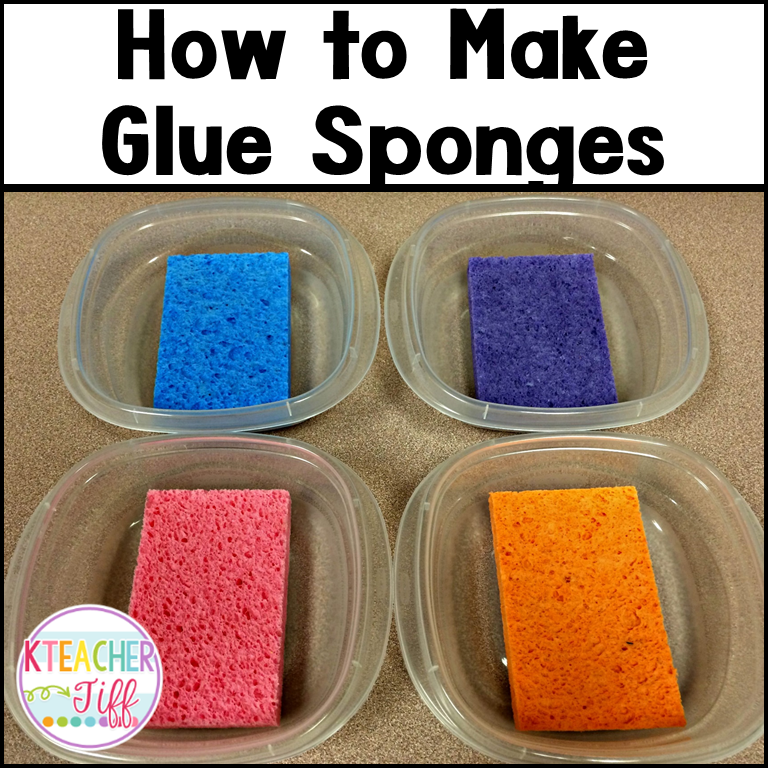 I had heard of this idea, but didn't realize that all the glue was soaked up by the sponges! It should make it more difficult to make a mess that way! I wonder if this would work with mod podge. It should work. I've found the best results with all the modifications I made to be using clue diluted by 1/3-1/2, and mod podge is close to half strength glue. This was a really non-compliant group ("worst" I've had in almost 9 years) and we "lost" a lot of containers, so I'm making some new ones for 2nd semester. I'm going to try super-glue and see if it holds up better to the dampness of the glue and see how a new group of students handles them. And I also tell my students who don't like them to bring their own glue sticks. These are far cheaper to keep going than buying hundreds of glue sticks each year! This is awesome! I will be doing this! 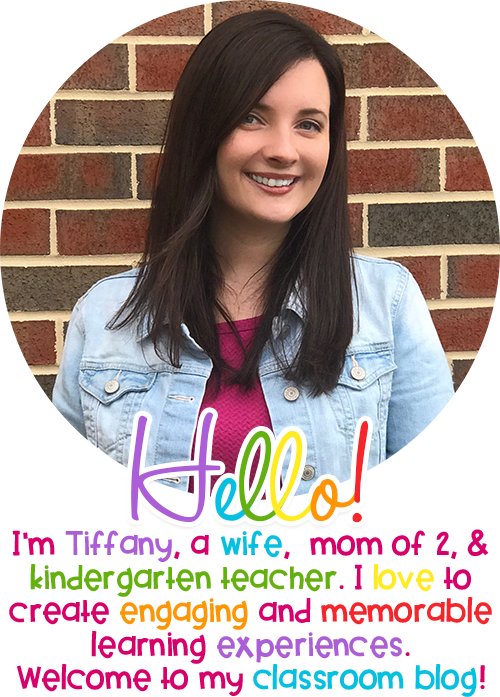 I am homeschool my 5 year old! Thanks for sharing! UGh..I hate glue sticks, because the glue does not have lasting power, and you go through SO MANY OF THEM! 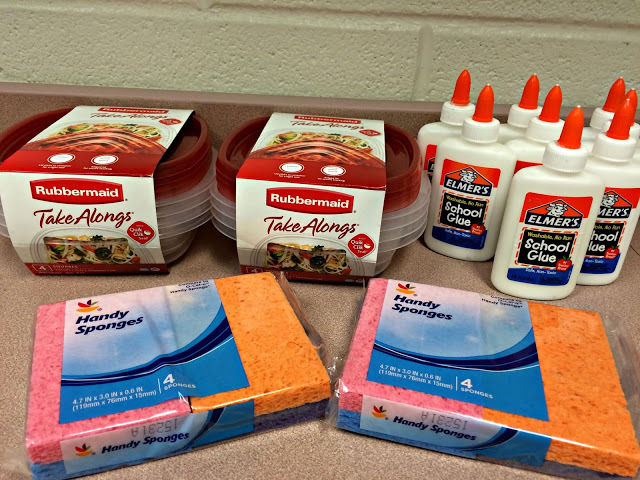 I subbed in a kindergarten classroom this week that was using glue sponges – LOVE THEM! As a sub, I am constantly told “I need a new glue stick” and then have to search the classroom to find the extras, if there are any. (Often I just tell them to share for now). But the aide in this classroom told me how a few of the teachers at the school have been using them, and how much easier it is! They have one glue sponge per table of 4-6 kids and it works perfectly. I am sharing this with my early elementary ed friends!! I used glue sponges for the first time this year with pre-k. They worked great. I added glue as needed and have not had any mold in the 8 months with 1 more month before school is out. I wish I would have seen this before I just bought more glue sticks. Such an awesome idea!